for years, me and others have been releasing software for the Oric, mostly in emulator format, but now and then we've been releasing physical versions, complete with inlays and manuals, both for tape an floppy. One thing that always annoyed me was that there was no common packaging for this software. Unfortunately there was no equivalent for floppy software, simply because there was not enough of it released, and when it happened some was released on 3" and some on 3.5" inch format, which is why we ended up having Blake's 7 in a CD case, because it kind of worked for both, but it felt kind of lame, the best example is that I tried to find my case of Blake's 7 to take a photo and it took me 10 minutes to find it because it had been moved and was lying between two Dreamcast games. The box is slightly lower than the tapes, but inside there is enough room for one or two floppies (can fit both a 3" and 3.5" if you want), with still a bit of room for a slim manual, or one single floppy with a mammoth thick manual, and the outside is large enough to have large color inlays, name on the side, screenshots and description on the back [technically, you can also put a tape inside, it fits]. I did a quick test with Blake's 7 (with my laser monochrome printer, so no colors). Not sure what you think, but that could be an interesting format for future games, or re-releasing inlays and manuals for this format. I loved the crystal case version, especially in color, probably because it reminded me a more recent era, when most of the (cheap) 16/32 games were released in this form of packaging. Anyway, the back "DS" case have a more vintage feel, I admit. I like how you managed to make it look good both in color & grayscale. The only thing that bug me on the new "DS case" version is the missing ORIC logo on the facing, even if you have it on the side. Just for historical information, Cobra Soft used VHS boxes, and had a multi-usage plastic "adapter"inside its latest versions. It can be used for tapes or 3.5" disks, and probably (I didn't check) 3" disks. The box was manufactured by "Vimeo" in France. That being said, such huge box is really annoying to store. Their goal was to be bigger, so more visible, on store shells. The final version is supposed to be in color, just that I only had a B&W printer to do my tests. Yeah, I have a few of these, they take a hell of a room, and some have the plastic inside gets very brittle so removing and putting the tape ends up destroying the content. Are they available somewhere for download so they can be printed out? From memory, only small pearls are missing. I got scans of them but discovered that some hints in other boxes are missing, or are just copies of the previoux boxes hints (out of stock probably), or new hints were added. A real mess I never tried to sort out, especially as one can't tell if a hint has been added, or if it was previously missing! This is really nice. I have been looking for a solution to package my games, and ended up with a big cardboard box. There exist crystal cases for tapes and floppy disks 3.5", available to buy. I remember VHS cases for floppies and I think there were sold later in DVD format. But nowadays all the options I found (DS, PSP, Wii and PS4 all have different cases, I think) share one problem for me that you seem to have solved: the internal shape to hold a disk. How did you do that? Regarding the white foam inside the box, it was supposed to be black, and with a red underlayer, but the shop was out of stock, so all I had was the white foam. But that gives an example of how that could looks, alternate possibilities is thermo forming, like what Symoon was showing, but I don't have the equipment. About the foam, so you buy a small slab, cut it and open a 'compartment' with the shape of the floppy? How do you do this? with a cutter? 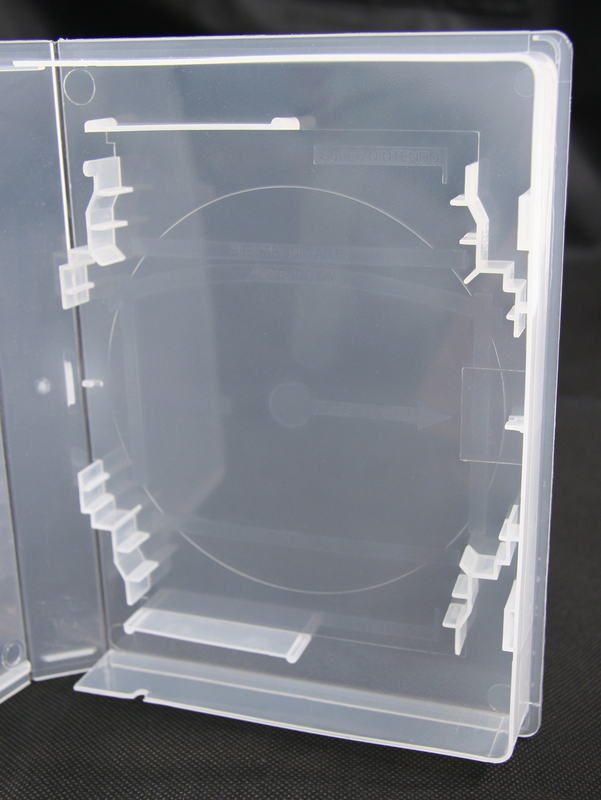 And what about the internal 'compartments' that come to fit the DS cartridge? Did you cut them off? Yes, I've put a cutting board between the transparent window and the plastic, used a small cutter (scalpel) to cut out the plastic, that makes a hole, but the idea is to put a rectangular filler to hide it (can just be a black or red sheet of plastic, cardboard, anything rigid and opaque would do) glued to the rest of the case plastic. Regarding the foam, in this test I did that with a rectangle with a rectangular hole in it (but from a material usage point of view, it would probably make more sense to cut a bunch of "L" shaped elements [so it's like <<<<<<< cuts], and use two of these to form the final rectangle), glued to the filler rectangle. The need for a standard packaging reminds me of the Universal Game Case (cf http://thevideostoreshopper.com/univers ... ve-insert/) which can host many (console) cartridge types and looks like this: http://thevideostoreshopper.com/images/ ... -755-3.jpg (image too large so I could not insert it in the post). The retro publisher RGCD (https://www.rgcd.co.uk) uses it for their releases with a special foam which guarantees a snug fit of the disk/cartrige, they even sell a replacement case visible here: http://rgcd.bigcartel.com/product/repla ... ing-deluxe. The re-edition of Thalamus' Hunter's Moon (which I got via their IndieGogo/KickStarter campaign) uses this case and the C64 cartridge fits very snugly into that foam. The foam is a bit too thick for my taste as this cause a slight bump in the case door but this is easily solved by shaving off a few millimeters from the back of the foam and sticking back into the case. Maybe it would be worth contacting RGCD to ask them if they would be willing to manufacture an Oric compatible case? My trouble has always been finding a case where the 3.5 floppy could fit and which does not cost more than the floppy itself! A CD case and other I tried fail to close with the floppy inside because of the reliefs of the compartments which hold CDs or cartridges. And they are also quite hard to cut, without damaging the case itself. I know there existed cases similar to those of DVD films (or VHS tapes, but those are really big) which were prepared to contain floppies... but I just cannot find them anywhere for sale.